What would you do if you saw a person falling from the 11th floor of a high rise building? While most would probably panic and freeze, one brave guy took immediate action and actually put himself in harm’s way to try and catch a woman as she was plummeting to the ground. 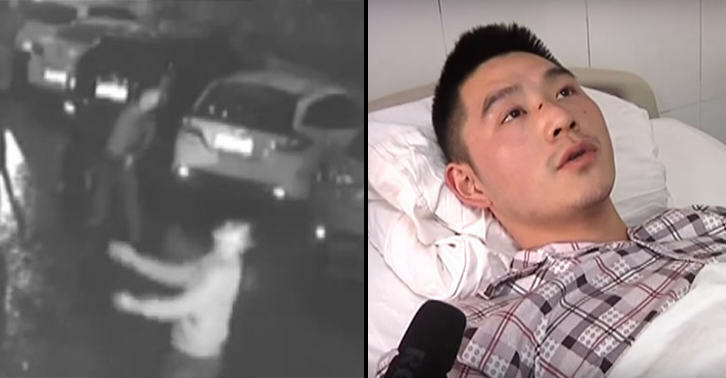 The young Chinese man is being hailed as a hero following his incredible actions of selflessly attempting to break the woman’s fall in Enchi City in central China’s Hubei Province. As reported by the Irish Times, the man – identified as Mr. Feng – was leaving a restaurant when he heard her screams and leapt into action. Sadly, the height of the fall was so great that Feng could do little to save the woman – he was knocked unconscious by the sheer force of the collision and suffered a number of injuries. He was knocked out by the impact and suffered injuries on his knee joints, and had a tibial plateau fracture. His anterior and posterior cruciate ligaments and the medial ligament have been dislocated. Tragically, the woman did not survive the fall.